How to remove stains, and your sanity. Everyone loves a BEFORE AND AFTER shot. And everyone loves a home renovation story too. So let me present to you what I have been doing for the past week. I’ve been cleaning up our bathroom. Before: The grout was stained yellowed and patchy brown. It was NOT a good look. It looked like 20 years of accumulated dirt, crusty chemical build-up and general wear and tear had seeped into the grout. Lovely right? 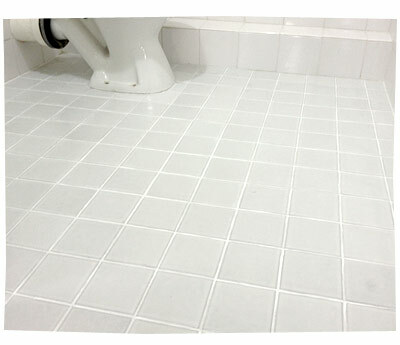 After: Sparkling white grout! I am a genius. I know. But, let me tell you people, it was such paaaaainful and agonisingly slow work. My husband and I decided that we were NOT going to spend $7000 on a new bathroom renovation. And although he can do the tiling himself, he was unavailable. You know, the whole “I have a full time job” excuse followed by the whole “I have to be a happy parent to 3 young boys”. Yeah OK, I let him off on this one. So if I wanted a clean looking bathroom, I had to clean it myself. Hmph. First I tried an organic home cleaner (what a joke! ), then a normal heavy duty cleaner, Jiff, bleach, sugar soap, proper grout cleaner, oxygenated whitening cleaners and cleaning acids. NOTHING worked. I was so desperate, I was going to try whitening toothpaste. But I decided that that was such a stupid idea! Absolutely nothing removed the yellow and brown stains from the white grout. I was SO ANNOYED! All that experimenting took me 3 hours. Then I bought a tile rake. 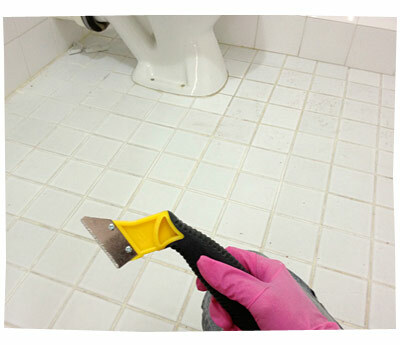 It’s a metal scraper that grinds off the top layer of grout. Like sand paper. It took me about 3 hours to scrape all the grout back. And guess what. After digging down into the grout, I discovered that the stains were not just on the surface of the grout… they went deep. Then I used a grout paint. That’s right. I freaking HAND PAINTED the whole grout grid, with white paint, using AN ARTIST BRUSH!! It was a bloody masterpiece I tell you. I bet Michaelangelo didn’t have to do this crap. All that hand painting took me about 4 hours. 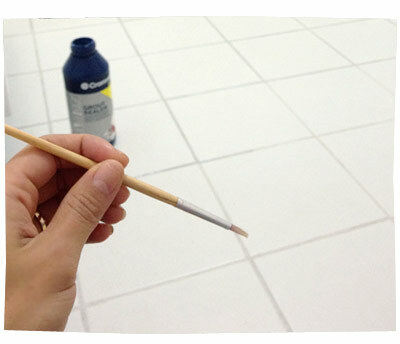 The label on the paint bottle said that the dried paint could easily be rubbed off tiled surfaces. I should have tested it first. Because for my first coat, I painted the grout in big messy lines and let the paint splash up onto the tiles. Big mistake. BIG mistake. Because the excess paint on the tiles was NOT easy to remove. So now I had to scrape all the dried paint OFF the tiles, which subsequently messed up my first coat of paint IN the grout (where I actually wanted it). That took me another 4 freaking hours. Then I painted the grout with a second coat of white paint. 2 hours. Seal the paint with grout sealer. 2 hours. Grand total of 18 hours, spread out over 1 week. It looks great now, but holy freaking crap it was painful!